Good read performance, write performance equivalent to a single drive. No data is loss when 1 disk fails, as both disk have the same exact data. 50% of the space is lost due to both disk will have to store the exact copy of data. This article will guide you through the steps to create a software RAID 1 in CentOS 7 using mdadm. The same instruction should work on other Linux distribution, eg: Redhat, Fedora and etc. Step 1: Installing the prerequisites and examine the drive. 1. As mentioned earlier, we are using mdadm to create and manage our RAID, so let’s install the package using yum. Some distribution of Linux may have pre-installed this package. 2. 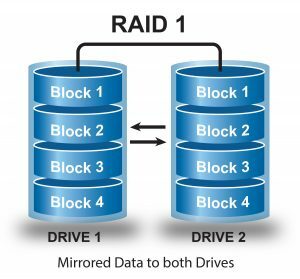 Examine both of the drive whether is there any existing RAID configurations. This should show No md superblock detected on /dev/sdx. 3. We require a minimum of 2 partition /dev/sdc and /dev/sdd for creating RAID 1. Let’s create partition on the 2 drive with fdisk, and change the type to RAID during partition creation. Press ‘n’ for creating a new partition. Press ‘P’ to choose primary partition. Press ‘1’ to select the partition number as 1. Use the default starting sector and ending sector by just pressing 2 times Enter key. This will use the entire drive for this partition. Press ‘t’ to change the partition type. Press ‘fd’ to choose Linux Raid Auto. Press ‘p’ to print the partition table. Press ‘w’ to write changes to disk. Once the /dev/sdc partition is created, follow the same instruction to create a new partition on /dev/sdd drive. 8. Mount the newly create file system under /raid1 and try to create some files. 9. To auto-mount the RAID1 during system startup, you need to add the below line into the bottom of /etc/fstab.